I've never been to New Mexico, but it is our neighbor, and we have some great friends who recently moved there, so I'm sure it won't be long until I pay a visit. Happy to know how seriously they take their animal laws. • In Deming, hunting is prohibited in Mountain View Cemetery. Because, aren't we all thinking about hunting when we visit a cemetery. First thing that pops in my mind. • It is illegal to gamble on bicycle races, but not ostrich or camel racing. Bicycles deserve the same basic protective rights that so many other important beings enjoy. Except the ostrich and the camel. Definitely not them. • It is a crime to kill a song bird. All birds, get to singing! • It is against the law to trip a horse. 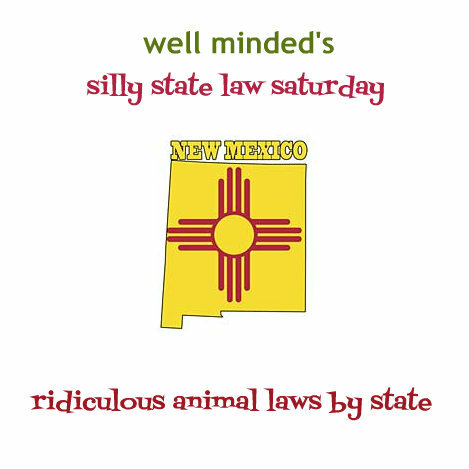 New Mexico just takes the fun out of everything, don't they? • All food fed to swine must first be cooked in government-approved facilities. Since the government is doing such a great job of maintaining the safety of the human food supply, I'm sure this is a great protection to the pigs. • It is a crime for unregistered entities to feed garbage to swine. Where do I register? • Harassing a fire dog is against the law. Well, naturally. Who in their right mind would do such a thing? Though, now that I think of it, I can produce a pretty accurate siren sound. Might be fun to see the reaction. • It is a crime to hunt an animal and not consume its meat. Well, at least there's that. We all know how I feel about hunting. • The sale of subhuman primates may be regulated by the Department of Health. That's just all kinds of insulting. • Animals taken for rattlesnake roundups and lizard races are exempt from wildlife laws. So as long as I say "I'm stealing this camel for my rattlesnake roundup, and after we're done with that, he's my date to the lizard race," I'm free to swipe him? Just want to be clear on this. Oh–wait–they don't care about camels. Well, an ostrich, then. Oh...wait...that won't work, either...I'm so confused. • Fees must be paid on commuting sheep. So does this mean the sheep have to pay to use the HOV lane on their way to work, or does this only apply to toll roads? • It's a crime to shoot a cuckoo. I'm assuming they are referring to the bird, here. • One who illegally kills a javelina can be fined $400. I've actually, truly, had these creatures on my doorstep multiple times. Here in the desert, they love the pumpkins we leave out at Halloween time, and they've even been known to munch my potted plants. They are strong and bold, deserving of protection. Though you're the one that might need protection if you cross the path of a javelina. So often this all goes back to natural consequences. • Hunting jaguar is prohibited. All other animals should convene at Mountain View Cemetery. Please join us next week when we take a look at New York.